Throughout January 2018, around 54,199 North Jakarta residents have visited the RPTRA's library.
" The average daily visit is reaching 1,700 people"
North Jakarta Library and Archives Sub-dept. Head, Bambang CH admitted people's interest to visit RPTRA library in North Jakarta is higher than other regions. "The average daily visit is reaching 1,700 people," he stated, Friday (2/9). Maman Suwarman, Section Head of Library for North Jakarta Library and Archives Sub-dept. 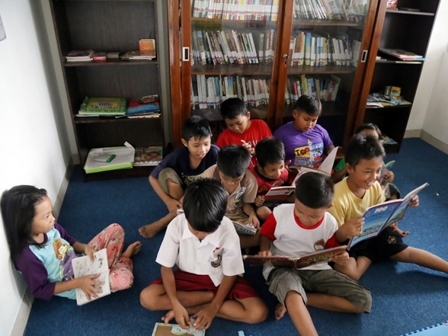 added 60 libraries from 64 RPTRAs in North Jakarta have been operating maximally. Of the entire RPTRA library, five of which are favorites to visit are Bamboo River, RBU, Penjaringan Indah, Walang Baru and Sunter Muara. "The visitors are varied, starting from the children, the mothers to fathers in the neighborhood of RPTRA often visit," he stated.